If advertising was honest. 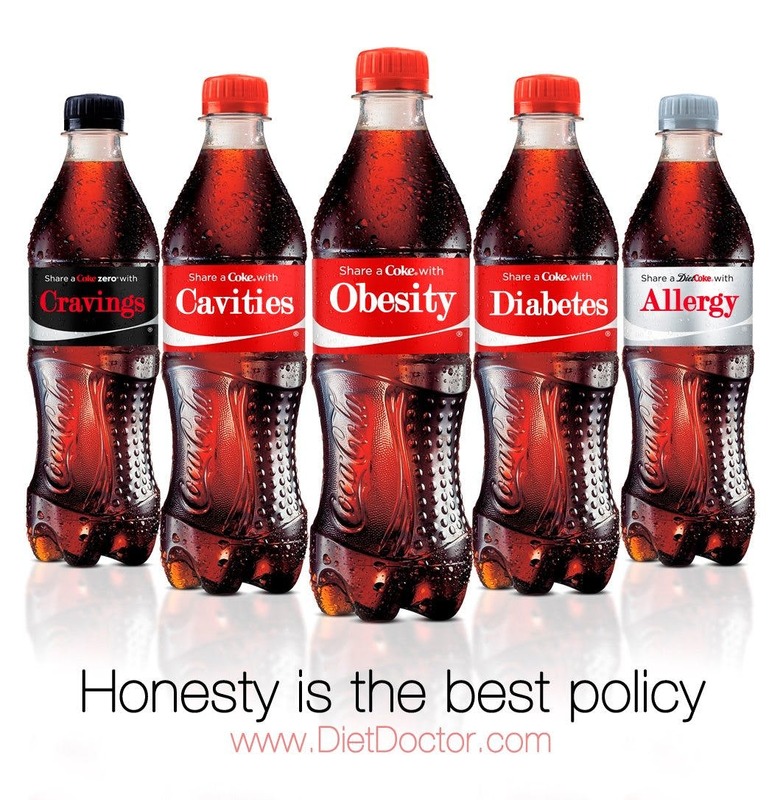 Check out less honest Coca-Cola ads. More about weight loss and diabetes. Note: This is based on the massive “Share a Coke” campaign that is live in Europe and may be headed to America soon. The picture above is translated from a similar picture in Swedish, inspired by one in Norwegian. Feel free to share it. Cool! But what are "caries"? Sorry – I changed "Caries" into "Cavities". Better? Why this is extra fun is the ongoing summercampain in Sweden, where cocacola has changed their labels to the 150 most popular names and want us to share with a friend, take a photo and send it to them for a sweepstake. So they started this themselves! Apparently it's all over Europe now, after a successful similar campaign in Australia in 2011. US next year? This blog is starting to be more and more cocacola-centric. ;-) Let's talk about nutrition and science, OK? Maybe I'm alone here, but I'm not very interested in CocaCola/McD activism. Are these the kinds of posts that people want to see? Come on Doc... Give us something of quality and at least make it worthwhile to visit this blog. Sugar is bad, Coca-Cola is bad, America is fat.. we get it. Next. LCHF-ers just want to have fun, yeah; LCHF-ers want to have fun. In the policy discussions posts, the view always gets expressed that matters should be left to freedom of choice. But that means developing strength of will and a capacity for critical analysis. Posts such as these that make fun of Coke's manipulative marketing serve that purpose, and are often humorous. It inspires to the road of health. We need the human ZellZ perspective to balance the dry science. Dr. Eenfeldt: You have to see this old Coca cola add in the link below. "Laboratory test over the last few years have proven that babies who start drinking soda during that early formative period have a much higher change of gaining acceptance and "fitting in" during those awkward pre-teen and teen years...."
Who and when was the picture was created? I'm using it for a visual analysis paper.